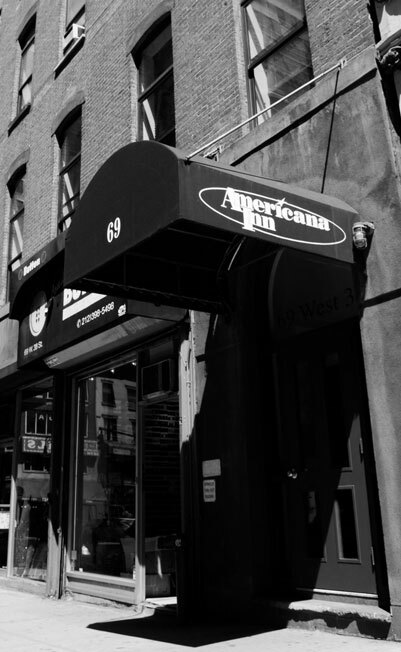 The Americana Inn was built with the savvy New York tourist in mind. By combining convenient amenities, an excellent Midtown NYC location, and value-priced stays, guests can discover the best of staying among hotels near Bryant Park while remaining budget-friendly. We offer an ideal choice for travelers searching for budget hotels in New York. Each of our 61 affordable NYC hotel rooms comes with an LCD flat screen TV, and the hotel's shared baths have been recently renovated. Each floor at The Americana Inn features a kitchenette complete with refrigerators and microwaves; some feature gas stoves. Stay any Sunday night to receive 15% off our best available rate! © The Americana Inn 2019. All rights reserved.